For future doctors trained and educated at our School of Medicine, no moment in their four-year journey is charged with more anticipation and meaning than Match Day. A few weeks later, in the springtime glory of Commencement, they’ll get a diploma and formally take the title “Doctor.” But on a brisk Friday morning in mid-March, they rip open an envelope to find out where they will live and work while completing a residency—in-depth training within a specific branch of medicine. 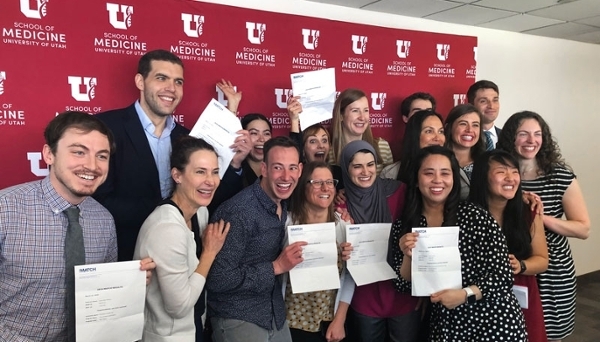 At University of Utah Health, Match Day is also significant because it serves as a measure of how well we’re preparing providers to deliver high-quality health care. This year, 95.8% of our fourth-year students matched on March 15. That’s almost full two percentage points above the national average of 94%. The 120 graduates in our class of 2019 will enroll in 93 residency programs in 30 states and 1 province. How do the matches come about? There’s nothing random about the process. It’s not a matter of drawing names out of a hat. It’s a highly deliberative process involving tens of thousands of students at 144 medical schools in the United States. The National Resident Matching Program (NRMP) was created in 1952 to place students into residency training programs located in United States teaching hospitals. The computer mathematical algorithm takes a student’s ranked choices for residency and combines them with choices made by teaching hospitals among candidates to their programs. That’s how matches are made. The NRMP algorithm won the 2012 Nobel Prize in Economic Sciences. That matching algorithm is the same one used to match kidney transplant recipients with their donors. The matches completed by computer algorithms is the easy part. For students, securing a residency match is an arduous four-year process they complete in addition to coursework. In my role as Associate Dean of Student Affairs, I meet with each student once a semester, from the very beginning of their first year of medical school. We go over everything: their academic plan of study, their academic performance, research, service, leadership, volunteering, and their specialty choice. We discuss preparation for three big licensing tests every student is required to take. Step 1 is taken after second year, while Step 2 CK and Step 2 CS are usually taken in the first half of the fourth year. Their scores are a primary determinant for who wins interviews during the match process. I ask students to let me know by February of their third year what they’re thinking regarding residencies. That’s when the pressure starts. In the fourth year, students apply to programs. Getting an interview is a key part of what I track with each senior. The interview season begins in October and runs through February. An interview is a two-day process and frequently requires travel. For the most part, our seniors have between 10 and 20 interviews to secure a residency. The record this year was 34. Finally, by February 21, students submit their carefully, painstakingly determined ranked order list to the NRMP. 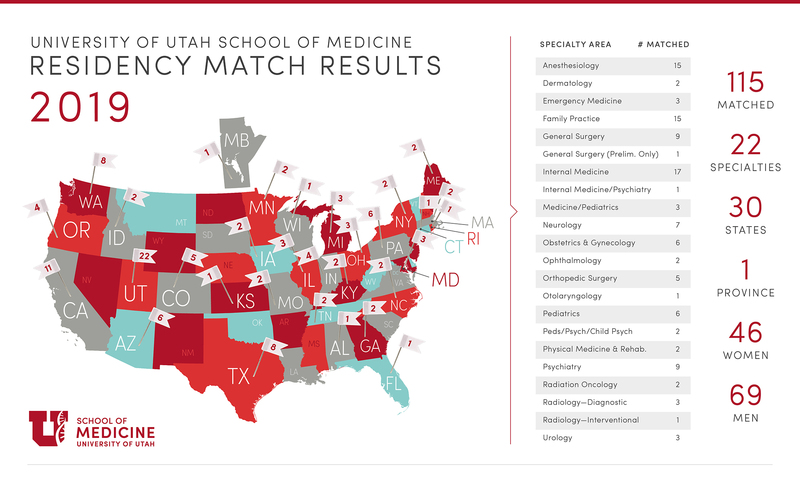 At U of U School of Medicine, we take pride in the fact that we can match our students anywhere in the country in great programs. Physicians out of our medical school have an enviable national reputation for serving as top-quality residents. But there’s more to Match Day than meets the eye. It’s much more than the hoopla, shouts of joy, big sighs of relief, hugging, high-fiving, picture posing, and picture snapping. Other than physicians who’ve been through it, not many people understand how difficult the transition from medical school to residency can be. How emotionally difficult it can be. How emotionally difficult it usually is. Even after opening an envelope that metaphorically serves as a ticket for an exciting career to come, I know from my experience advising them that most of the giddy seniors are wondering if they are really prepared for the road ahead of them. Most fourth-year students are handling an identity crisis and asking themselves, "What am I really doing with my life?" While proudly celebrating a significant life accomplishment, most are simultaneously wrestling with who they are and what they’re seeking. They really don’t know, yet. They do know they beat the odds to get into med school. And they’ve successfully completed a Doctor of Medicine degree. It’s a dream realized. Still, they might have doubts about what they’ve got themselves into. They know they're pretty good students and can take a test well. But will they be an empathetic, caring surgeon? Will they help frightened parents understand treatment options for a critically ill child? The information inside a Match Day envelope gives medical students enormous pride and tremendous satisfaction. But it does not mean the most challenging part of their lives is behind them. 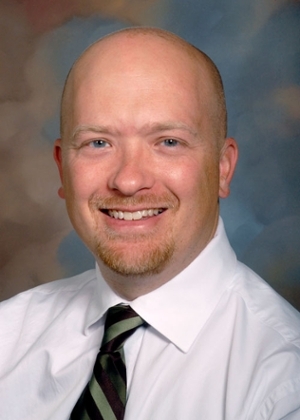 Guest blogger Adam Stevenson, MD, is Associate Dean of Student Affairs, School of Medicine. Previously he served as Assistant Dean for Clinical Curriculum. His specialty is pediatrics.